All of us go through unexpected surprises in life, often shockingly difficult. When that happens, we tend to avoid dealing with them, adjusting to them, learning from them. Yet, it so happens that the most growth (and with it, joy) happens when we actually turn towards these difficulties and work our way through them. The good news is that these are best done with others, rather than as a DIY project. 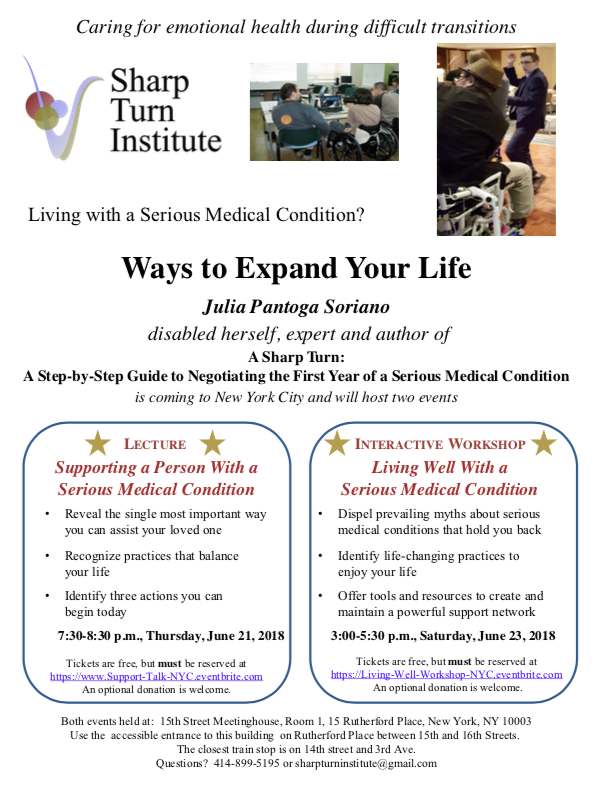 We have invited Julia Soriano to help us understand the dynamic of sharp turns in life. Although her personal story and expertise are around difficulties we encounter with our health, we find it applicable to anything in life. Dealing with a sharp turn in life is a skill that is transferable and very valuable, not just in the way we care for ourselves, but in the way we care for our family, friends, and neighbors. It is almost certain that you will need these skills to care for someone you love very much. Julia is one of those quirky (in the best possible sense of the word) Quaker thinkers/practitioners that is incredibly grounded. There are three opportunities to interact with Julia. This Sabbath, we will continue to share our reflections from our Citylights retreat and discuss how our "harmless bad habits" may hurt our faith. It may seem harmless, but it may affect our spiritual growth and relationship with the people who we do life with at home, work, and our spiritual community. Perhaps your bad habits are being addicted to your smart phone, always running late, or maybe forgetting to sleep on time. As a community we will share many ways how we can break our "harmless habits" and find creative ways to replace it with good ones to nurture our personal growth and to thrive.